Head coach Bruce Bowden often turns to Scripture when instructing the members of the Holly Grove archery team. But one story he loves to tell comes from the book of Samuel — the tale of David and Goliath. As the story goes, Goliath, one of the strongest, most feared men throughout the land, accepted a challenge from David, a small, young boy who many believed wouldn’t stand a chance against the mighty warrior. With only a sling and stone in hand, David conquered Goliath in what became one of the most famous underdog stories and a message of inspiration to several modern-day sports teams. That was exactly what it did for the 2017 Holly Grove squad. 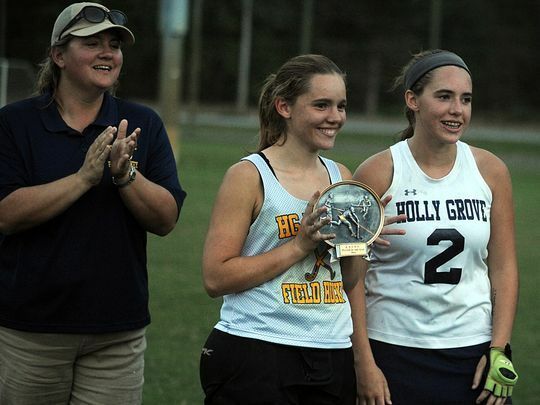 Still one of the youngest teams in the state, Holly Grove downed almost every opponent in its way, capturing a state, national and world championship. Coming into 2018, the squad was determined to repeat its success, only the road would be much tougher this time around. During the season, Holly Grove had become more of the Goliath, maintaining its reputation of a group of sharpshooters who eventually made it back to the state tournament. But prior to the Maryland NASP state championship on March 17, disaster struck. In a group made up of 68 elementary, middle and high school students, more than 10 were hit with an illness that caused fevers, sneezing and several other rough symptoms. Dubbed one of the best archery teams in the nation, Holly Grove’s head coach knew he needed his team at full strength to defend its title. Although they didn’t feel 100 percent, the archers stormed into the state championship, determined to win more medals for their work in bullseye and 3-D shooting. With their trusty bows by their side and a sea of support backing them up, the Holly Grove archers took their places one by one. Participating in the three different divisions, the members went to work defending their title. A senior at Holly Grove, Christian Blair took the shooting line in one of his last competitions as a high school archer. Although he had grown up using a bow to hunt, Blair had only recently started shooting competitively. Participating in both bullseye and 3-D, the senior was prepared to make his presence known to his opponents. Almost immediately, Blair found his groove, putting each of his shots at nearly every spot he intended. Once his scores were tallied, it was revealed the senior had finished with 290 points in each category, making him the top male scorer at the competition. Blair was awarded a $2,000 scholarship and a new bow for his performance. “I fell right into it, and once I started hitting my first couple of shots, that was it,” Blair said. “It was the best feeling that I’ve had probably in my life. I wanted this all year long, and that’s what I’ve been practicing for the most. Blair wasn’t the only archer to find success at the individual level. Several members of Holly Grove took home personal awards, including sixth-grader Mackenzie Bennett, who finished second overall in the bullseye category, giving her a $1,000 scholarship. Bennett was instrumental in the team’s success last season, placing at both state and nationals. Although she’s transitioned from the elementary to middle school level, the sixth-grader is still determined to bring in as many accolades as possible and enjoy her time with the squad. The Holly Grove Christian School will be undergoing some construction when its doors open in the next few weeks. But it won’t be a new classroom or new lockers that are added to the halls — instead it will be a brand-new trophy case for the Eagles archery team, which will enter the 2017-18 school year as world champions. After missing out on the 2017 Indoor 3D World Championship in Florida due to a lack of funds, Holly Grove’s archery team made the trip to Pennsylvania to try their luck in the 3D outdoor section of the championship. Following several first-place victories in regular season tournaments, the Eagles swept the competition at the state level and ultimately advanced to the national stage. Holly Grove finished as one of the top 100 teams in the nation, but still had its sights set on a larger prize — the worlds. Divided into elementary, middle and high school, it was the Eagles’ elementary squad that represented the Shore in the World Championship. Going toe-to-toe with some of the best young archers in the world, the Eagles maintained a sense of calmness and refused to let the pressure of performing on archery’s biggest stage get in their heads. One after the other, Holly Grove archers ranging from 8 to 11 years old made their way to the platform hoping for a clean shot. “It was very exciting, and it took a lot, I mean a lot of practice,” Graysen Wright said with a laugh. As the competition played out, it was clear early on that Holly Grove was creating a gap that no other team would be able to catch. After shooting a 1,505 — 190 more than the second-place squad — Bowden and his team heard the words they had dreamed of hearing. The Holly Grove archers were world champions. The team collected their first-place medals and quickly headed back to their hotel, where Porter was already getting the word out to her friends and family. After the excitement finally died down, the team made its way to the hotel pool, swimming and laughing while reliving their victory. But before anything, Bowden and the rest of the archers made sure to do something not many high school teams still participate in following a competition. Bowden has used prayer and scriptures as one of the team’s primary tools to establish confidence and focus. The idea that God will love the archers regardless if they win or lose had helped Wallace and others shoot their bows without necessarily worrying about the outcome. Although the season is officially over for Holly Grove, the team won’t have too much time to rest before preparing to defend their title. The archers will be back in action come November, but even after a world championship, they want to add to their new trophy case. "I think we can do it again next year," Wright said. Bowden would like his team to become a three-star champion, a recognition of the squad that has the largest combined score for the nationals and indoor and outdoor worlds. But before they start focusing on next season, the team is busy celebrating the victory. Students are to purchase and read before school starts; there will be a test the second day of school. All High school students are required to participate in the summer reading program. It is a part of their curriculum and enhances their vocabulary and analytical skills. Please have your student read the books listed below during the month of August, so it will be fresh in their minds when returning in September. Students are to thoroughly read the books listed above. There will be discussions, a project and a test on the books during the first week of school. Ninth grade does not have to do written work on the books over the summer, but they will be held accountable for reading the books. Please contact Mrs. Scarborough at cscarborough@hgcsweb.com if you have any questions! Happy reading! Archery has always been a major part of Bruce Bowden’s life. Since he was a young boy, he grew up with a bow-and-arrow around while spending hours in his backyard perfecting his skills as an archer. Bowden's two sons, Trent, 14, and Trevor, 11, have also grown up with a bow in their hands and spending their days after school in the woods hunting deer and turkeys. Knowing how much he and his family enjoyed archery, Bowden decided to take it to Holly Grove Christian School as a competitive sport. “This is something I did just about my whole childhood, and I would have loved to have this when I was in school,” Bowden said. “This is kind of a dream I’ve had the last 20 years, and me and the coaches finally got the school to agree to do it as another sport." Less than two years ago, the Holly Grove archery team was nothing more than a thought. The only time students had with a bow was a short period in the year in P.E. class. But with Bowden and his coaches’ leadership, paired with the skill set of the 52 Holly Grove archers that joined the team, the Eagles have created not just one of the best squads in Maryland, but one of the best in the country. "We just kept working hard, people kept giving money, we kept being able to buy more targets, more bows, more arrows and things just seemed to fall together," Bowden said. Holly Grove is part of the National Archery in the Schools Program, an organization that focuses on motivating kids academically while teaching archery skills. 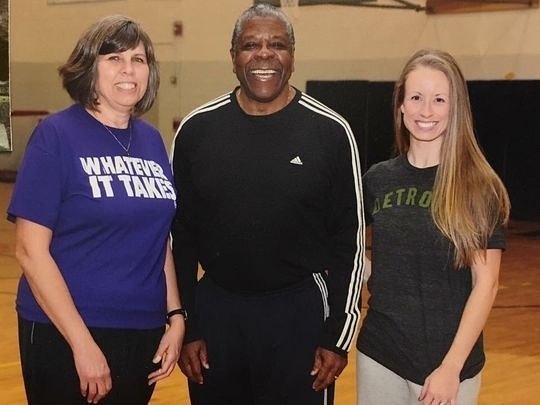 In its inaugural season, the team, which is divided into three categories: elementary, middle and high school, took part in just one tournament to get its feet wet. With that experience under their belts, the Eagles returned last October with the goal of making the state championship, and they succeeded. The Holly Grove Archery team won four of the six team championships at the state level. Not only did the Eagles advance to the state title match, but they swept the competition, earning first place in the elementary, middle and high school 3-D categories. The team also won the top prize in the elementary bullseye category, giving it four of the six team competitions, while McKenzie Bennett and Trent Bowden took home individual awards. "I practiced really hard at home on my targets," Trent said. "I like to hunt and I like shooting bows so that's why I thought doing archery would be fun. My first competition I was really nervous, but it was also exciting. After a while I started to settle down and wasn't nervous anymore." Holly Grove qualified for nationals in Louisville, Kentucky where the school finished as one of the top 100 teams in the nation. Holly Grove's elementary team was even invited to attend the worlds match in Orlando, Florida, but due to a lack of funds, the Eagles are unable to attend the event in July. "We've got a great backing, and the parents and grandparents and everyone have been real supportive and helped us have the funds for a lot of other tournaments, and hopefully now that people know what we can do, we can get some more support from other places," Bowden said. The road to the state championship didn’t come easy for the team. While many of the 52 archers had prior experience with a bow, the nerves brought on by competing against other teams were something Bowden and his staff looked to bring down. Like he’s done many times in his life, Bowden turned to religion. “For two weeks, all I did was try to build their confidence up by using scripture that we had, doing devotional prayer and just talking, telling them we're good," Bowden said. "They were pumped going into the states." Being a Christian school, Bowden used several scriptures throughout the year to serve as motivation and inspiration as the team worked its way to the state and national championships. Before heading to states, many people told Bowden his team's inexperience would finally be displayed in front of the best archers in Maryland. But Bowden refused to listen, and encouraged his athletes to look to God. "After we went up and won everything that we did, I think, I could see it in their eyes that they had seen God," Bowden said. "They realized this was impossible with man, and truly God was with them." Mackenzie Bennett, 11, of Eden, draws her bow during a practice session on Friday, June 9, 2017. Bennett placed eighth in the nation for her efforts during the championship. The team was invited and honored by the Somerset County Commissioners on May 30 for its historic and exciting season, cementing itself as an official part of high school athletics on the Shore. The Eagles have high hopes going into next season, as they prepare to defend their state titles and make it back to nationals and ultimately worlds. "I want to be a state and national champion next year," Trevor said. "The first, quite a few (competitions), I got kind of nervous, but then I got calm once I got to the states. If I keep practicing, I think I'll make it." But for Bowden, at the end of the day it's not about how many trophies his team brings home. "All I ask for them to do is have fun. If I see a big smile, that's all I want," Bowden said. "They know all they have to do is do their best, and that's all I'm looking for." The star of this show is the Holly Grove archery team. We originally met this group of kids last year during their inaugural season, and now for their encore year, the team is heading to the Maryland state championships, where they prove hard work and dedication pay off. Holly Grove Christian School began in the fall of 1976 with nineteen students, and today serves over 550 students and their families. For over 40 years, Holly Grove has provided a quality education to families on the Eastern Shore by offering a traditional program for students in Pre-Kindergarten through 12th grade. The school is located in a beautiful rural setting on 51 acres in Westover, Maryland. Students travel to our campus every day from as far away as Delaware and Chincoteague, with many families making use of our seven bus routes. Holly Grove Christian School offers a strong academic program. Our graduates have received millions of dollars in college scholarships over the years. HGCS is accredited by Middle States Association of Colleges and Schools and ACSI. I invite you to come and enjoy the family atmosphere! We are here to serve you, so if you have any questions about Holly Grove Christian School, please contact me directly at mrohrer@hgcsweb.com.